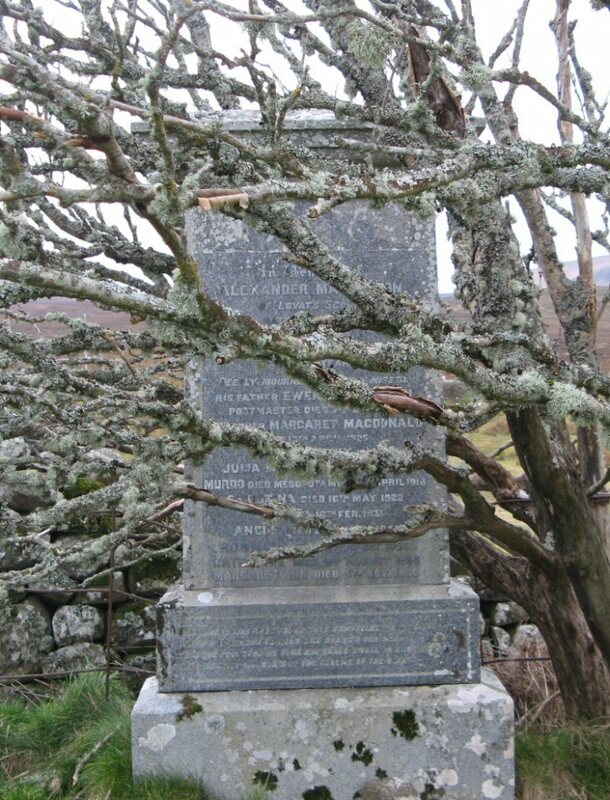 Skye Gravestones | Ewen & Margaret (Macdonald) Mackinnon. & family. Ewen & Margaret (Macdonald) Mackinnon. & family. In memory of/ALEXANDER MACKINNON/of Lovat's Scouts/killed in battle at Berryslaacte/South Africa/on the 26th of April 1901/aged 21 years/deeply mourned and sadly missed/his father EWEN MACKINNON/postmaster died 7th Dec. 1914/his mother/MARGARET MACDONALD/died 13th April 1925/their family/JULIA MARY died 16th Feb. 1915/MURDO died Mesopotamia 26th April 1918/CHRISTINA died 11th May 1922/JOHN died 16th Feb. 1931/ANGUS died 27th July 1942/RONALD died 10th April 1953/KATHERINE died 2nd August 1958/MARGARET ANN died 5th Nov. 1958. Hard, hard was the stroke/that compelled us to part/from a loved one so near and dear to our hearts/but the love that we bore him shall dwell in each breast. Till we meet him again in the realms of the blest.